Bari, a Kootenai County sheriff’s canine, best known for tracking down police killer Jonathan Renfro, was euthanized April 20, after a bout with cancer. As a K-9 handler, Shaw and his Dutch shepherd, Bari, made headlines over the years for the amount of drugs confiscated by the Kootenai County Sheriff’s Office, and for successful manhunts, but Bari’s biggest moment was a nationally recognized effort to find the man who shot Coeur d’Alene Police Sgt. Greg Moore. 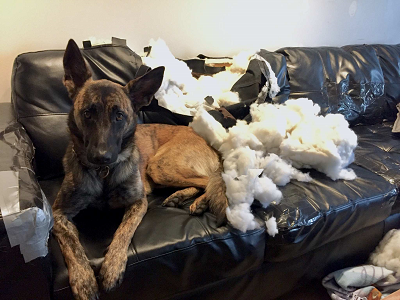 Dutch shepherds are such special dogs, aren’t they? www.pressherald.com wrote: Westbrook police said that Cal will be trained in apprehension and drug detection, with the first part of his training focused on patrol work, apprehension and tracking. www.battlecreekenquirer.com wrote: The Calhoun County Sheriff Department on Thursday introduced Rocket, a 2-year-old Dutch Shepherd. [Deputy Guy] Picketts said the dog will be used for routine and periodic searches of schools in the 14-districts patrolled by the department and others if requested. www.kptv.com wrote: The suspect grabbed the dog, got on top of her and pushed her down into the mud, according to the sheriff’s office. A spokesman said the suspect held the dog's head down in the mud and nearly killed her. Valli, a 2-year-old Dutch Shepherd that has been working full-time with the sheriff’s office since October 2017, was taken to VCA Animal Hospital for evaluation and continues to remain under observation at home. Joshua Miller  faces charges of first-degree robbery, interfering with a law enforcement animal, assaulting a police officer and interfering with a peace officer. www.nbc4i.com wrote: After enduring the grief of losing his last K9, Junior, to bone cancer in December, Pataskala Police Officer Randy Morton didn't think he'd be able to take on another 4-legged partner. Enter Demon, a 12-week old Belgian Malinois Dutch Shepherd mix. www.mystateline.com wrote: PECATONICA - The Illinois State Police has added a new officer to the ranks of officers on patrol in Winnebago County: Gambit, a Dutch Shepherd, who just recently completed his 10-week training at the Illinois State Police Academy. www.wbur.org wrote: Four K-9 veterans will receive the American Humane Lois Pope K-9 Medal of Courage on Tuesday on Capitol Hill, for demonstrating "exceptional valor" during their service in the U.S. military. Taba, a 9-and-a-half-year-old Dutch shepherd, also worked with the Army detecting explosives and doing patrol work. www.watertowndailytimes.com wrote: The 91st Military Police Battalion hosted the all-day competition that consisted of three events. In the morning, the K-9 teams participated in a scavenger hunt that consisted of detecting items by smell and an obedience exercise. Unfortunately, Taba the Dutch Shepherd, recently lost her leg to cancer. www.thepublicopinion.com wrote: (Officer Cody) Trumm traveled to Alabama to pick up Sadie in February, a month before beginning their initial training. Sadie is a Dutch shepherd from Holland, where dogs are often bred and trained for professional police work.